Models Own - the creator of fashion forward nail colours - have joined forces with ultra cool London Nail Art Salon WAH to create a brand new collection of nail art pens. WAH, having their finger firmly on the fashion pulse already love and sell the coveted colours produced by Models Own in their flagship Dalston salon, Topshop pop up store and now Lucy in Disguise. Both WAH and Models Own causing a storm all over the press and blogging world, the first collaboration between the two brands will be hotly anticipated. Founder of WAH Nails, Sharmadean Reid is frequently asked by customers where they can buy nail pens, so the collaboration with Models Own made perfect sense. "We want to be the last word in fashion forward nails and this allows our loyal customers to take the brand home with them - WAH Nail designs in Models Own colours". Known for their colourful leopard print, candy stripes and innovative nail design, WAH has achieved cult status for the ability to create pretty much any design or pattern for their customers. With Models Own fearless colour collection and WAH's experience, the new nail art pen will make it easier to achieve the creative looks of WAH at home. 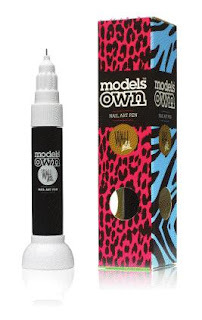 Initially launching with black and white pens, the range will continue to grow to include all 99 nail polish colours currently available from the models own collection. Each nail pen has a duo application system consisting of a thin nib for intricate art work along with a long thin brush to add strokes and lines. Revolutionising the at home manicure, you'll be able to create personalised, unique nails without leaving your home! Are you a fan of Nail Art? I am super excited about these, can't wait til they hit stores! !